The Planes of Fame Museum in Chino, California is a remarkable facility featuring an extraordinary collection of military and civilian aircraft. Having visited this facility perhaps 25 years ago, I found my recent visit to the museum to be a remarkable and rewarding experience. This article will highlight some of the aircraft on display at the museum and also afford some insights into the origins of the museum and its founder, Ed Maloney. Every aviator and every person with an interest in aviation history is indebted to Edward T. Maloney, the founder of the museum. With the end of WWII, Maloney saw military aircraft being scrapped with no concern being given for preserving the history of American aviation or the men and women who operated American military aircraft. Ed Maloney was on a mission. He was on a mission to preserve our American aviation heritage. With a collection often aircraft, Maloney in 1957 opened “The Air Museum” in Claremont, California. By 1963, the museum had moved to Ontario, California. In 1970, the flyable aircraft were relocated to Chino, California, while the non-flyable aircraft and automobiles were on display at “Movie World: Cars of the Stars and Planes of Fame Museum.” With the closing of the Movie World museum, the name “Planes of Fame” stuck and by 1973, the museum had consolidated its collection at the Chino Airport, the former base of Cal Aero Academy that trained I0,000 military pilots during WWII. In 1995, the museum opened its facility in Valle, Arizona featuring 40 aircraft, many of which are flyable. Ed Maloney passed away in 2016, but his memory lives on with the volunteers and staff members charged with preserving, restoring and displaying the treasure of aircraft acquired by the museum over the years. Currently, there are 150 aircraft, 50 of which are flyable. The aircraft on display are in pristine condition, and many of them are very rare. Some of the aircraft displays are complemented with videos of pilots and mechanics who flew the aircraft and give testimony to their actions in WWII in defense of the freedoms we enjoy today. The test pilots among us will find of interest the interviews of Tony LeVier, an air racer and test pilot for the Lockheed Corporation during WWII. LeVier’s accounts of the testing and improvements made to the Lockheed-P38 with aviation legend Kelly Johnson are fascinating. We should all give thanks to Ed Maloney for his vision in collecting and preserving these rare aircraft and the institutional knowledge required to maintain and operate them safety. The grounds and facilities of the museum are neat and clean in appearance and feature ample parking. The logo or trademark of the museum appears over the entrance. Upon opening the door to the museum, one is immersed in the roaring thunder of an Allison V-1710 engine, along with a wall-sized mural of a P-40 Warhawk featuring the tiger shark emblem on the nose. One then makes a left turn and walks along a corridor that features large photographs showing the history of the museum along with the men and women who have contributed to the operations of the museum and been honored at the museum. The gift shop features a collection of attractive aviation apparel, and this is where you purchase your ticket to tour the museum. Leaving the gift shop, one enters the Edward T. Maloney Hangar which houses two P-51 Mustangs, a P-26 Peashooter, a Boeing P-12E/F4B Biplane Fighter, and a Boeing FB-5 Navy Fighter. The surroundings are immaculate. You could eat off the floor. Next, you may visit the Pond Hangar where you will see, among others, a remarkable P- 40 aircraft in Royal Air Force camouflage, and P-51 Mustang in polished aluminum livery. Both aircraft have Curtis Electric Propellers with authentic decals on the propeller blades. The aircraft are immaculate. In observing the finish and condition of the aircraft on display, it is clear the staff of volunteers has gone to every length to ensure the aircraft are presented as they would have appeared during the Second World War. The collection in the Pond Hangar also includes a polished aluminum F-86 in Korean war markings, a Douglas Skyrader in Navy markings, and a North American SNJ-5 Texan. All of the aircraft are meticulously maintained. The walls are adorned with photographs of WWII fighter pilots along with model aircraft in various configurations and color schemes, with a particular emphasis on the Republic P-47 Thunderbolt. The attention to the Republic aircraft is appropriate, since a Seversky AT-12 Guardsman is on display in authentic colors of the Army Air Corps prior to the outbreak of WWII. You may exit the Pond Hangar and walk through a B-17 Flying Fortress sitting on the lawn in close proximity to the main entrance. A museum staff member provided an extensive oral history on the B-17 and related there are ambitions of returning the B-17 to flight status. Adjacent to the Pond Hangar is the USS ENTERPRISE CV-6 Hangar which includes a collection of U.S. Navy aircraft. This includes an F9F Panther, an F7F Tigercat, an F8F Bearcat, and a TBM Avenger. The walls of the ENTERPRISE Hangar are adorned with shadow boxes featuring uniforms and photographs of naval aviators, aircraft carrier models, and models of Navy aircraft. One display plays particular tribute to the achievements of the crew of the U.S.S. ENTERPRISE during WWII. I neglected to mention that the ENTERPRISE Hangar also features a Douglass SBD Dauntless and a Douglas A4B Skyhawk. The Friedkin Restoration Hangar included a notable aircraft including an F4U4 Corsair in mint condition. The aircraft looks as though it just the Chance Vought Factory. The Friedkin Hangar also featured a Hispano HA-1112 (ME-109G) in Luftwaffe Colors, a pristine North American B-25, a Northrup N9NB Flying Wing, a North American 0-47 under restoration, a P- 40 in Royal Air Force colors in dessert sand markings along with a Tiger Shark motif on the nose, a YP-59 Bell Aero under restoration, and an Aichi D3A2 (Val) under restoration. Adjacent to the Friedkin Hangar or the premises of the Fighter Rebuilders Shop where a Grumman F8F Bearcat was under restoration. Parked outside the Fighter Rebuilders Shop was a pristine Grumman OV-1 Mohawk in airworthy condition. The museum features an extensive library cataloging aviation history and artifacts with an emphasis on the Second World War. One of the volunteers in the library showed me a 1944 Sectional for Southern California that could be purchased at that time for $0.25. By today’s standards, the content and format of the sectional was fairly simple without depictions of Class B, C and D Airspace. The Lockheed P-38 Lightning and the 475th Fighter Group Displays included a P-38 in perfect condition and nose art featuring a running indian and the caption “Twenty Three Skidoo.” Included in this hangar were displays where one could watch an interview of Tony LeVier recounting his experiences as a test pilot for Lockheed Aircraft Corporation during WWII, and the solutions Lockheed developed to deal with “compressibility” in the P-38 aircraft. The comments he made about how the aircraft was modified to address these problems were remarkable. Another video screen featured comments of the pilots and crewmen who served with the 475th Fighter Group in WWII. The hangar included a collection of A-2 flight jackets from pilots who flew with the 475th Fighter Group. In Outdoor Storage, one could see an immaculate Republic RF-84K Thunder Flash along with a Canada Air F-86 and a North American FlO0. Also in Outdoor Storage was a well­ preserved North American FJ-3 Fury. Adjacent to the P-38 Lightening Hangar was the Jet Hangar & Air Racers Hangar featuring a MIG-15, a MIG-17, a MIG-21, an F-86 and a host of air racing aircraft from the 1930s. Some of the most unique aircraft were housed in the Foreign Hangar. The Mitsubishi A6M5 Zero is in pristine condition complete with its original Sakae engine. The paint on the aircraft is immaculate including the emerald green primer appearing in the wheelwells. The aircraft looks like it just left the Mitsubishi factory in Japan. The color scheme is completely authentic for the timeframe of its operation. A Focke-WulfFWI90A is on display. Kurt Tanks’ “Butcher Bird,” like the Mitsubishi Zero, is immaculate and in flying condition. A Yokosuka D4Y Comet (Allied Code Name “Judy”) is on display in authentic Japanese colors along with a Mitsubishi J2M3 Thunderbolt (Allied Code Name “Jack”) which, like the Zero, was designed by Jiro Horikoshi. The Jack was very unpleasant surprise for Allied pilots late in WWII. No collection of Japanese aircraft would be complete without a Yakosuka MXY-7 Ohka Suicide Rocket Plane designed to smash into Allied ships. A collection of German rockets and artifacts is also on display including a Fieseler V– I rocket and a Fieseler Storch liaison aircraft. replica., the He- I 00 on display is complete with authentic German markings and is very Impressive. While walking about the museum, I had a chance to meet again with Steve Hinton who is the President of the museum. 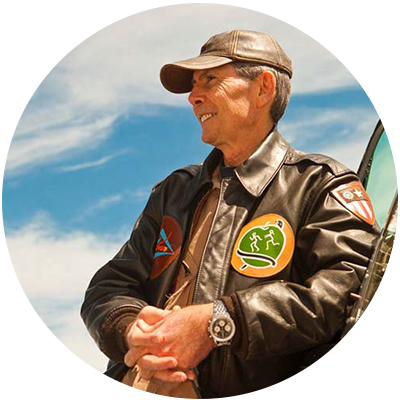 An extraordinarily gifted air racing and warbird pilot, Steve is very unassuming. His actions give testament to the vision of Ed Maloney. Every member of the staff at the museum was courteous and devoted to his or her mission or task. The men and women who serve and volunteer at the Planes of Fame Museum set a remarkably high standard for aviation museums in the United States. Hopefully, we will all recognize our debt to Ed Maloney and the personnel, volunteers and staff of the Planes of Fame Museum.